As expected and predicted by a whole bunch of you on our Facebook Poll, during the WWDC 2012 proceedings a couple of hours ago, Apple unveiled their refreshed MacBook Pro and MacBook Air laptops. It was no surprise that both the MacBook Pro and MacBook Air were due for a refresh but the question that was on everyones mind was just how much of an improvement were the laptops going to get. Starting with the MacBook Air, the svelte notebooks got an Ivy Bridge refresh across the board, giving up to a 2.0GHz dual-core i7 with turbo boost up to 3.2GHz. 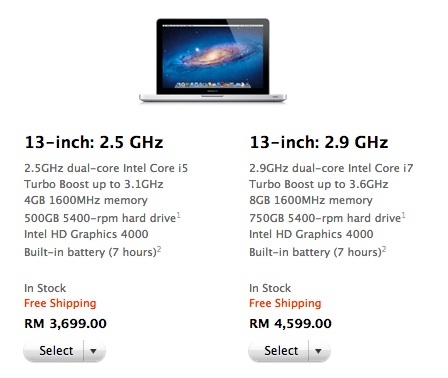 The MacBook Airs also got up to 8GB RAM and up to 512GB Flash Storage. One of the most glaring omissions from the last set of laptops was USB 3.0 which has finally made its way to the MacBook Air and it couldn’t be too soon. The built in camera was also upgraded to output 720p video. Hit the jump for details on the refreshed MacBook Pros! Of course the MacBook Pros also got an Ivy Bridge Refresh with added Kepler hardware to make the flagship line an even more formidable beast than it already was. The MacBook Pros also gained the elusive USB3.0 as well as the bells and whistles the MacBook Air got. The addition of the GeForce GT 650M graphics chip is a fantastic one as it is already proven as one of the nicest graphics processors to date on a mobile device. 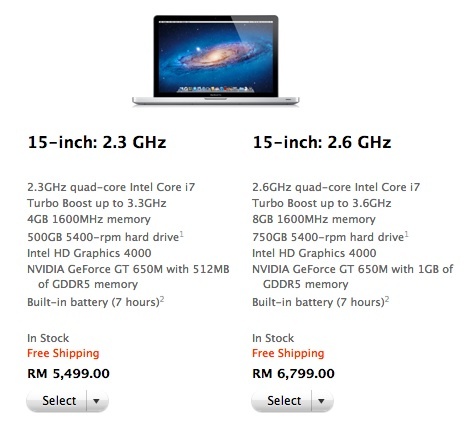 The 13inch MacBook Pro will run you RM3,699 for the base model (2.5GHz dual core i5/4GB RAM/500GB HDD) and RM4,599 for the upgraded model (2.9GHz dual Core i7/8GB RAM/750GB HDD). On the 15 Inch side, the new MacBook Pros will run you RM5,499 for the base model (2.3GHz quad core i7/4GB RAM/500GB HDD/GT 560M with 512MB GDDR5 Memory) and RM6,799 for the upgraded model (2.6GHz quad core i7/8GB RAM/750GB HDD/ GT650M with 1GB GDDR5 Memory). As with all Apple Products, there are also made to order SKUs available on the Apple Online store. I for one now own a under 1 year old, obsolete MacBook Pro. Anyone want to buy it so I can get a new one? Head on over to the online store to check out the new MacBook Pro and MacBook Air.